The hotel is situated on a leafy boulevard just one block away from Hyde Park and Paddington Station, with fast train to Heathrow airport and good connections by tube to Central London and the City of London.All the bedrooms are simply furnished but very.. The hostel is located just five minutes walk from Russell Square underground station. Within fifteen minutes walk are Covent Garden, Oxford Street and lively Theatreland.The rooms are small and in fair condition with bright colour schemes. The hostel..
Quality backpacker accommodation in central London location near Russel Square. Please note that guests must be at least 18 years old. Generator Hostel London offers quality accommodation on a budget and is centrally located in the Bloomsbury area near..
Hotel in Bayswater. 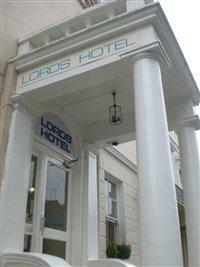 Lords is a simple hotel located in Bayswater. The hotel is built in 2 different buildings situated next to each other.Hotel facilities include a breakfast room. The guest rooms are equipped with WC/shower, telephone and TV. The hotel..
Smack dab in the middle of Camden Town- pub and club district, we?re the closest hostel to Camden Markets and if you?re angling for access to all the partying and good times you could want, without compromising on security, comfort, and cleanliness, then..
Smart Russell Square is the perfect hostel to reach any destination in London with ease, as its right in the centre of London and very close to main bus routes and the London Underground. Very close to the hostel is the world famous Camden Market, a selection..
Smart Russell Square Hostel is perfectly located in the heart of London to provide a great experience, created with the backpackers and budget traveller in mind. Located just off London's and Europe's most popular shopping area, Oxford Street, less than.. The hotel is a basic and clean, well-maintained property, situated in central London. Hotel 65 is a friendly Bed & Breakfast style hotel spread over several buildings all sharing one large breakfast room. To start the day right guests can enjoy a tasty continental or English breakfast.